The white griffin on red field is from the Polish arms of Gryf, here particularized by using a gold border with maple leaves for this Canadian branch of the family. The wild rose alludes to Mr. Chledowski’s birth in Alberta. 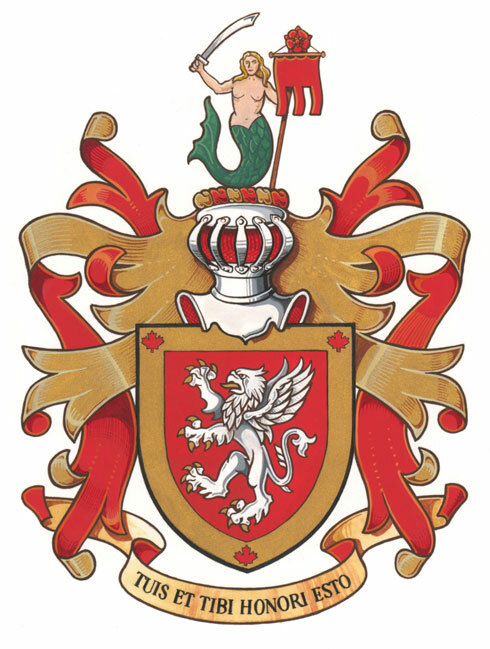 His wife’s ancestral background is symbolized by using a mermaid based on the arms of the city of Warsaw. The gonfalon alludes to her Polish herb Radwan. This phrase in Latin means “Bring honour to thy family and thyself”.